This PDF file can be used either as a handout or can be printed out poster size. 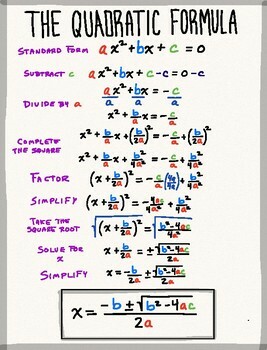 It contains a detailed and easy to read derivation of the Quadratic formula. Anybody who’s ever taught the Quadratic formula probably has students that ask about the formula and why we know it. It’s not always easy to cover the derivation in the classroom when so many other standards are being hit. This resource can be given directly to students or be posted up somewhere in the room to pique their curiosities.